Fall is fast approaching and summer has turned your once neatly managed property into the neighborhood jungle within a matter of months. Your goal is to clear that overgrown brush and make something of it. At first it can seem like an overwhelming task. But with a few tips and a dumpster rental from Rubbish INC, you can clear out brush on your property in time for a summer barbecue! First, decide what you want to do with the space. This helps you to determine how much room you will need and which type of brush to remove like trees, shrubs or other plant life. Perhaps you would like to create a garden, install a pool, or maybe even a breezy gazebo or playground for the kids. But if you’re planning on a garden, we suggest refraining from the use of herbicides. If you don’t have some of these items, don’t sweat it! Many big box hardware stores and equipment rental businesses rent these types of equipment by the day, week or month. Even though tool and equipment rentals might add to the initial cost of your project, it will save you tons of time – and pain – in the long run. Bulldozers are excellent go-to’s for shrubs and trees up to 12” in diameter while backhoes can help to excavate stumps and root systems. Caveat – “Remove tree and shrubbery stumps as they can become a trip hazard and cause costly damage to your mower blades”. Keep in mind if you opt to leave a stump or prune back existing trees and shrubs, many will sprout back later if not properly treated immediately. For most invasive wood species like basal bark, apply a mixture of triclopyr used in the esther formulated Garlon 4 and diesel – or mineral oil – on the lower 12 inches of tree stumps or stems by painting the stumps immediately after you cut them. For woody brush and weeds up to 3” thick, use a walk-behind or pull-behind brush mower. Brush control around fences can be tedious. Out of control brush can leave fence lines damaged by becoming entwined, stretching and breaking the wire, and shorting out electric fences. Tree limbs can fall and roots can impede the fence posts. 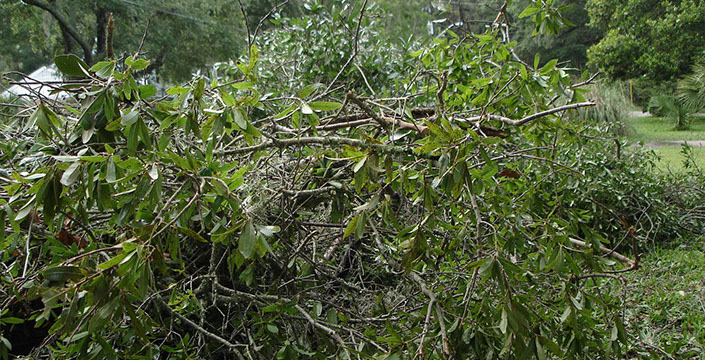 Use a chainsaw and pruning shears to surgically remove trees, shrubs and low lying limbs. For those pesky weeds and vines; Roundup® (glyphosate) diluted with 50 % water. This is typically effective against most species of brush. Stump grinders and wood chippers are effective necessary methods of breaking down large tree stumps and root systems, as landfills will are not able to process them. Therefore, contacting local landscaping services are the best option for stump disposal. For most other yard waste including shrubs, tree limbs, clean soil and other non-hazardous waste; a dumpster would be the most cost effective solution. Dumpster sizes range from 10 to 30 cubic yards, so large yard waste and debris removal is a breeze and affordable with one time with easy loading, flat rate pricing and flexible scheduling. 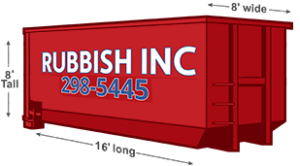 Contact us today for a fast dumpster rental price quote!